Designed and manufactured in France, the mid-engined, two-seater coupé features aluminium construction to keep weight to a minimum and sophisticated double-wishbone suspension. The A110 Première Edition is powered by a turbocharged, 1.8-litre, four-cylinder petrol engine, which develops 252PS. Like all Alpines, it’s rear-wheel drive. Limited to 1,955 examples – a nod to the year Alpine was founded – the A110 Première Edition was fully reserved within five days of going on sale. The production series A110 will follow shortly. The first new model for two decades, the A110 Première Edition marks the relaunch of Alpine. Conceived as a standalone business unit within Groupe Renault, Alpine has an ambitious long-term strategy that invokes the vision and determination of its founder, Jean Rédélé. As well as a rich heritage in building agile, lightweight sports cars that are in their element on winding mountain roads, Alpine is also well-known for competing at the highest level of international motorsport. Its crowning glories include winning the 1973 World Rally Championship title and outright victory at the 1978 24 Hours of Le Mans. It is in that same spirit that Alpine today competes in international endurance racing. Its title-winning FIA LMP2 World Endurance Championship programme showcases the brand’s ambition and commitment to motorsport. New for 2018, the recently announced one-make Alpine Europa Cup for race-prepared A110 Cups, which will be run by Alpine’s racing partner Signatech, demonstrates the coupé’s performance as well as Alpine’s commitment to customer racing. Michael van der Sande, Managing Director, Alpine, comments: “It is an enormous privilege to relaunch a brand that instils such passion – but a big responsibility too. This passion for Alpine, both within Groupe Renault and among sports car enthusiasts, is huge. It has long been our ambition to bring Alpine back. Now, the time is right. “With the new A110 Première Edition we’ve taken the core principles that made Alpine so successful in the Sixties and Seventies – such as compact size, light weight and a very low centre of gravity – and deployed them with modern technologies. The car is an absolute pleasure to drive on country roads or on the track, but also very comfortable to drive every day. The Alpine project was announced in 2012 and four years later, in 2016, the Alpine Vision show car was unveiled in Monaco. A year later, the road-going A110 Première Edition made its public debut at the Geneva Motor Show. Conceived as a responsive, fast-moving standalone brand under the Groupe Renault umbrella, Alpine has its own dedicated design and engineering teams. Carving its own clear niche in the sports car segment, the A110 Première Edition goes on sale in 11 markets in Europe, as well as Japan and Australia, with further markets still to be announced. It will be sold through dedicated dealerships – some 57 in Europe alone – by knowledgeable and highly trained advisors. The initial batch of 1,955 A110 Première Editions was allocated via a mobile app, which allowed buyers to place a refundable deposit and reserve a car. Every one of those A110 Première Editions was reserved within five days, illustrating the level of excitement there is for Alpine’s return among sports car enthusiasts. Order books for the production series model will open soon, although the app can be used to secure a position on the waiting list immediately. A110 Première Edition deliveries will commence in continental Europe in March 2018 and in right-hand drive markets in the second quarter of 2018. The A110 will be manufactured at Alpine’s factory in Dieppe, northern France. Originally built by Alpine-founder Jean Rédélé in 1969, the Dieppe site has continued to produce low-volume, high performance Renault Sport cars in recent years. Now, Alpine production will return to Dieppe and, as part of the relaunch, the factory has been heavily upgraded and modernised. Bernard Ollivier, Deputy Managing Director, Alpine, comments: “In 2012, at the beginning of the project, I was appointed to create a new Alpine sports car from a blank sheet of paper. It had to be true to the DNA of Alpine – agility through light weight, very elegant and a pleasure to drive. “We gave our designers complete freedom to imagine what a modern day Alpine should look like. They had very few technical constraints. It is unusual to approach it this way, but that is the reason for the very strong design we have today. “Starting from a blank sheet of paper we could also create our own platform. One of the big objectives for the A110 was ‘feel at one’ – the driver should feel at one with the machine. That means the centre of gravity and the roll centre have to be very low in the car, which you can only do with a dedicated platform. Michael van der Sande adds: “Since we announced the relaunch of Alpine, the response has amazed us all. Even though Alpine went away for 20 years there is still so much passion and enthusiasm for it, not only in France, but all over the world, too. “The first thing we did when we announced the return of Alpine was develop a design language that would do justice to the original models, while also demonstrating our ambition and modernity. We then developed a technical concept – one of lightweight construction and absolute driving pleasure – that would make the new car stand out in the sports car segment. From the beginning we said the new car had to be true to Alpine’s DNA. Only once we had achieved that did we build the business model to go with it. “We decided Alpine should be a dedicated business unit with its own designers and engineers. We wanted these very passionate and skilled individuals to be completely dedicated to Alpine, to work closely together in agile, responsive teams. We’ve also developed a dedicated network of dealerships with highly-trained advisors. We felt only this approach would enable us to be sharp enough in front of a very demanding set of customers. “I am so pleased Alpine production is returning to the factory in Dieppe, in the very same production plant that was used to build Alpines all those years ago. The whole setup and culture there is still geared around low-volume, high-quality, sporty cars. Employee motivation is very high at Dieppe and the team there is very proud to wear the Alpine logo. It’s a fantastic group of people. Lightweight, agile and rewarding to drive, the A110 Première Edition is above all else a true Alpine. Designed from a blank sheet it has been engineered to thrill and engage the driver at all speeds, prioritising driving pleasure above lap times and outright power. It does this without compromising on everyday comfort, and it can be enjoyed by drivers at all levels of experience or ability. Its lightweight construction, low roll centre and perfect weight distribution allow the driver to feel at one with the machine. The aluminium chassis and bodywork form the basis for the A110’s poise and agility. Bonded and riveted to reduce weight even further, the compact aluminium body offers the best possible balance between rigidity, weight and build quality. At just 1080kg (with fluids) the lightweight A110 occupies its own niche within the sports car segment, offering a uniquely engaging driving experience. Additional weight saving measures include aluminium suspension components, very lightweight Sabelt sports seats that weigh just 13.1kg each and, in a world first application, Brembo brakes that incorporate the parking brake into the main rear caliper. This alone saves 2.5kg. As well as the lightweight construction, the A110 owes its agility to the all-round double-wishbone suspension layout. Whereas most cars in the premium sports car segment use simpler strut-type suspension systems, Alpine’s engineers favoured a double-wishbone arrangement for the multitude of ride and handling advantages it confers. The first advantage is linear suspension kinematics. As the car rolls during cornering, the double-wishbone suspension enables the tyre contact patches to remain flat to the road surface, meaning they generate a strong and consistent level of grip. The harder the car corners, the more firmly the tyres are pressed into the road surface and the more grip they generate. Conversely, a strut arrangement would cause the tyres to tilt into positive camber where they lose grip, causing the car to slide. This precise control of wheel camber means the engineers can use lightweight, hollow anti-roll bars, because there’s no need to fight the car’s natural roll tendency. The use of double-wishbones also means the car has relatively long wheel travel and, because the A110 is so light, the coil springs can be reasonably soft. As a result the car has a very comfortable ride quality and supreme bump absorption capabilities, while still being characteristically agile and responsive, with no need for adaptive dampers. With the chassis working so effectively to generate cornering grip, the engineers have been able to fit relatively modest tyres. The Michelin Pilot Sport 4 tyres measure 205/40 R18 at the front and 235/40 R18 at the rear. They are mounted on forged 18-inch Otto Fuchs wheels, which reduce unsprung weight. The modest tyres, meanwhile, ensure the A110 has very progressive breakaway characteristics. This makes the car fun and rewarding to drive even at low and medium speeds for drivers at all levels of ability. The A110’s 44:56 weight distribution – perfect for a mid-engined sports coupé – is helped by the fuel tank being located immediately behind the front axle line. This means the A110 is perfectly balanced in cornering and the driver feels at one with the car at all times. With its very pliant ride quality and suite of driver aids – including ABS, traction control and stability control – the A110 remains useable, safe and comfortable day-to-day. The 100-litre storage space in the front is generous enough to accept a pair of airline carry-on cases side-by-side, while the 96-litre rear storage compartment can accommodate two full-face helmets plus an overnight bag. Supplied by renowned brake specialists Brembo, the A110’s 320mm brake discs with four-piston aluminium calipers on the front axle provide strong and durable stopping power. The stability control system, meanwhile, features an intermediate Sport mode, as well as a Track setting that allows a little more wheel slip before intervening, giving a more engaging yet secure drive. For track use, the ESC system can be disabled fully regardless of the selected driving mode. The three driving modes are Normal, Sport and Track. As the driver switches up through the modes such parameters as throttle response, steering assistance, gearshift speeds, exhaust sound and stability control intervention are all adapted to deliver a sharper, more thrilling and more emotional driving experience. The 10-inch digital TFT display within the instrument binnacle also changes with each driving mode, favouring the rev counter, gear display and gear shift lights in Sport and Track. With its active central exit sports exhaust – standard equipment on the Première Edition – the A110 combines day-to-day civility in Normal mode with a stirring, authentic sports car soundtrack in Sport and Track modes. The turbocharged 1.8-litre direct injection four-cylinder engine – customised by Alpine with specific intake, exhaust, and turbo systems plus bespoke calibration – develops a maximum power output of 252PS at 6,000rpm, with 320Nm of torque from just 2,000rpm. The responsive, energetic in-line engine delivers its power to the rear wheels via a wet clutch seven-speed Getrag dual-clutch transmission, which features Alpine-specific ratios. The gearbox offers fast shift speeds and combines a manual function – in which the driver can change gears using the aluminium paddles – with an effortless automatic mode. The brake-based electronic differential function, often referred to as ‘brake vectoring’, delivers superb traction even in slippery conditions. The car’s excellent power to weight ratio (228PS/tonne), plus a launch control function, enables the A110 to sprint to 62mph in 4.5 seconds. Its top speed is electronically limited at 156mph. The lightweight construction ensures excellent fuel efficiency (46.3mpg NEDC Combined) and low CO2 emissions (138g/km), too. With a flat underbody and functional rear diffuser, the car’s carefully crafted aerodynamics eliminate the need for a rear spoiler. This preserves the A110 Première Edition’s elegant, timeless silhouette. Air inlets in the front bumper, meanwhile, create a curtain around the front wheels, improving air flow and reducing drag. Another one of the car’s important characteristics is its very small frontal area. Compact dimensions and relatively narrow tyres mean the A110 Première Edition generates minimal drag. This improves both acceleration at higher speeds and fuel efficiency. The limited-edition A110 Première Edition comes very highly specified as standard. There is no options list – buyers simply choose between Alpine Blue, Noir Profond (black) and Blanc Solaire (pearlescent white) paintwork. Included on each A110 Première Edition are lightweight 18-inch Otto Fuchs forged aluminium wheels, an active sports exhaust, Focal audio system, carbon fibre interior accents, brushed aluminium pedals, leather-trimmed Sabelt one-piece sports seats, a numbered Première Edition plaque on the centre console and tasteful Tricolore badges on the rear pillars. David Twohig, Alpine’s Chief Engineer, comments: “The A110’s agility is all down to its lightweight construction and double-wishbone suspension. Those two aspects are at the heart of what makes the car such a pleasure to drive. Keeping the weight below 1,100kg means we can get away with using a relatively small engine and reasonable wheels and tyres, all of which helps to keep the weight down even further. It’s a virtuous cycle. “The same is true of the double-wishbone suspension front and rear. We don’t have to fight the roll of the car in cornering, which means we can use relatively light springs and anti-roll bars. That means the car rides really well even on a very bumpy road. The sensation in cornering is like that of carving on skis – the harder you push, the more grip you have. Laurent Hurgon, Chief Test and Development Driver, adds: “What is most important for me is that you don’t have to be a racing driver to enjoy the A110 and you don’t have to drive very quickly for it to be thrilling. It is also very comfortable to drive every day. For more experienced drivers, though, its performance is at a very high level. Inspired by the original A110 Berlinette, Alpine’s most iconic model, the A110 Première Edition forms a link between the brand’s heritage and its future. Led by Frenchman Antony Villain, the design team set out to capture the spirit of Alpine in the new car while also creating a design language that would stand the test of time. The twin front headlights, sculpted flanks, distinctive bonnet spine and wraparound rear screen are clearly borrowed from the A110 Berlinette, while the LED running lights and ‘X’-shaped LED taillights, with dynamic turn indicators, hint at the car’s modern day engineering and performance. The single, graceful line that flows from the very front of the car to the rear, meanwhile, is a signature Alpine design feature. With very few technical restraints to work around and an open design brief, the designers were able to realise a beautiful, elegant shape that’s instantly recognisable as an Alpine. The car’s clean, uncluttered silhouette has been achieved by working in parallel with the engineering team. A completely flat underside and functional diffuser mean there’s no need for a rear spoiler. And although the exterior dimensions are very compact, contributing to the car’s agility, the cabin still offers enough space for taller drivers to sit comfortably, even if they’re wearing a helmet. Access to the high-quality cabin is among the best in the sports car sector thanks to the low and narrow sill, while the interior itself reflects the A110 Première Edition’s lightweight construction. The floating centre console and exposed seat brackets give a sense of purpose and lightness, while the leather-trimmed Sabelt sports seats keep weight to a minimum. The Focal stereo, meanwhile, uses speakers that incorporate patented flax cone technology, giving a pure and detailed sound, while the aluminium pedals and passenger footplate mirror the car’s lightweight aluminium construction. Proudly displaying a numbered plaque on the centre console, each A110 Première Edition comes fully-equipped as standard, underlining the car’s day-to-day usability. Satellite navigation, climate control and cruise control ensure the A110 Première Edition is as effortless in everyday use as it is fun to drive. The Alpine Telemetrics, meanwhile, allows drivers to record lap times on track days and store performance driving data. The A110 Première Edition also comes equipped with MySpin mobile phone connectivity, which ‘mirrors’ the driver’s smartphone to allow safe and simple use when on the move, further underlining the car’s day-to-day usability. Antony Villain, Head of Design, Alpine, comments: “As a car enthusiast, designing a new Alpine was a dream opportunity. The A110 Berlinette is such an iconic car that it was natural to use it as a reference for the new model. We wondered; if the A110 never went away, if this new car was the sixth or seventh generation A110, what would it look like? It was important to make the link to the past, but the design also has to look to the future of Alpine and reflect the car’s modernity. “The first thing I did when we started on the project in 2012 was to organise a workshop. I took my team to visit the Jean Rédélé Collection in Paris, where 30 or so classic Alpines are stored – A110s, A310s, Le Mans cars and so on. I asked my designers to sketch each car very quickly, in just 30 seconds. The idea was to capture the main features of an Alpine, to discover the DNA and mood of the brand. Alpine owes its existence to one man – Jean Rédélé. Born in 1922 in Dieppe, France, Rédélé was a lifelong car enthusiast and a gifted driver and mechanic. He studied in Paris as a young man before establishing a car dealership in his home town, selling Renaults. A keen and competitive rally driver, Rédélé entered his Renault 4 CV in various motorsport events throughout the early Fifties, upgrading his car with each passing year. Rédélé achieved a series of class wins in famous motorsport events such as the Mille Miglia road race and the Critérium des Alpes rally (also known as Coupe des Alpes). Having identified a gap in the market, and encouraged by his motorsport successes, Rédélé established his sports car company in 1955. He chose the name Alpine in tribute to the Critérium des Alpes rally – scene of his greatest competitive achievement to date – which was staged in the Alps mountain range in the south of France each year. The tight, twisty Alpine roads gave Rédélé not only his company’s name; they also determined the fundamental set of technical principles that would define every Alpine car. Rédélé recognised that it wasn’t outright power or brute force that made a car quick on a twisty rally stage, but light weight, compact dimensions and agility. His first car was the Alpine A106, which was based on the Renault 4 CV chassis. In 1958 his second car, the A108, arrived with a chassis all of its own, but it wasn’t until the A110 Berlinette debuted in 1962 that his fledgling company really began to find its feet. By now Alpine and Renault were close collaborators, Alpine cars being sold and serviced by Renault dealerships. By the early Seventies, Alpine was a major force in top-flight rally competition. In 1971 Alpine won the world famous Rallye Monte Carlo for the first time, then again in 1973. The company went on to win the World Rally Championship Manufacturers’ title later that year, its finest achievement to date. Rédélé’s company had well and truly arrived. All the while, Alpine’s road car sales were growing. Rédélé built a dedicated factory in Dieppe in 1969 – the same facility that is producing the all-new A110 today – and in 1971 the replacement for A110, the A310, entered production. Two years later, Alpine was acquired by Groupe Renault. Alpine achieved its most famous motorsport triumph in 1978; overall victory at the 24 Hours of Le Mans. The factory continued to release new and innovative road cars throughout the Seventies and Eighties, including the A310 V6 and the GTA. Alpine production would eventually cease in 1995. More than 30,000 Alpine road cars had been built across 40 years, along with more than 100 single-seater and prototype racing cars. During the marque’s dormant years Alpine enthusiasts kept the brand alive across the globe by forming owners’ clubs and campaigning various Alpine models in historic motorsport events. Now, a new chapter is being written into the Alpine history books. Proving the performance, agility and durability of his cars in the crucible of motorsport was of utmost importance to Jean Rédélé. Alpine has competed at the highest level of rallying and circuit racing for decades, recording a string of famous victories that belies the company’s modest size. With that same ambitious and determined spirit Alpine today competes in the FIA World Endurance Championship. The one-make Alpine Europa Cup, meanwhile, demonstrates the A110’s inherent agility and performance on the race track. Although Alpine is perhaps best known for its rallying exploits in the Sixties and Seventies, and for winning the 24 Hours of Le Mans in 1978, the company has, in fact, competed right across the motorsport spectrum. Alpine has built no fewer than 70 single-seater racing cars, including two Formula 1 machines, and some 37 sports prototypes for endurance racing. The company also counts several rallycross championships to its credit, while amateur competitors have recorded in excess of 1,000 individual victories in hill climbs, club racing events and autotests. Demonstrably, motorsport is a core component of Alpine’s DNA. In fact, it’s true to say the company was as much a builder of competition cars as road-going sports cars when it was founded by Rédélé in 1955. The Frenchman had already earned himself a reputation as a formidable driver, thanks to a series of class victories in high-profile events such as the Critérium des Alpes rally. Campaigning modified Renault 4 CVs, Rédélé quickly proved his ability to prepare cars for motorsport, too. By the early Sixties Alpine cars were competing throughout Europe in rallies and road races, as well as on purpose-built race circuits. In 1963 the aerodynamic, long-tail M63 prototype – the company’s first dedicated circuit racer – won the French sports car championship. The following year the improved M64 prototype managed the same feat, as well as clinching a class victory at Le Mans. Driving Alpine’s first Formula 3 car, Frenchman Henri Grandsire won the French F3 championship in the same year. A string of national rally championship victories would follow soon after, the A110 victorious in Spain, France, Bulgaria and Romania, among others. In 1971, three A110s locked out the podium at the world-famous Rallye Monte Carlo, a feat Alpine repeated two years later. That dominant performance on the twisty, snow-covered mountain roads of the Monte would prove to be a portentous moment; Alpine went on to win the World Rally Championship Manufacturers’ title later that year. It was in 1978 that Alpine recorded one of its most celebrated motorsport successes. Driving the A442B sports prototype, Didier Pironi and Jean-Pierre Jaussaud won the 24 Hours of Le Mans, lapping the 8-mile Circuit de la Sarthe 369 times. By the mid-Nineties, Alpine had racked up 26 domestic and international rally titles, four rallycross championships and six single-seater titles. Using those decades of success as a springboard, Alpine returned to front-line motorsport in 2013 in a collaboration with French race stable Signatech. It immediately proved to be a triumphant return to racing; the marque’s A450 prototype won the European Le Mans Series title at its first attempt, and again in 2014. From there, Signatech-Alpine graduated to the FIA World Endurance Championship, competing once again on the world stage. The A450B secured a race victory in the LMP2 category at the 6 Hours of Shanghai in that first year. In 2016, that car’s replacement, the A460, won four of the nine rounds to secure the LMP2 WEC title for Alpine, the most hard-fought of those victories coming at the 24 Hours of Le Mans. Alpine continued to race in the FIA World Endurance Championship in 2017, winning its class at the 6 Hours of the Circuit of the Americas. 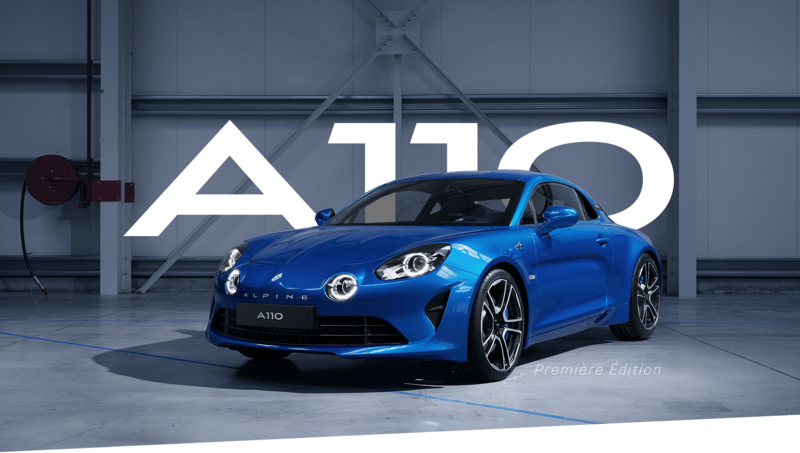 A racing version of the A110, the A110 Cup, has been developed by Signatech in close partnership with Alpine’s own engineers. With power lifted to 270PS and weight lowered to just 1050kg, the competition car is the ultimate expression of the A110’s remarkable agility and thrilling on-track performance. Additionally, Alpine has announced a one-make series for the A110 Cup. From 2018 the six-round series will take in some of the most iconic circuits in Europe, including Silverstone in the UK and Spa-Francorchamps in Belgium. Operated by Alpine’s FIA World Endurance Championship partner, Signatech, the Alpine Europa Cup further demonstrates Alpine’s commitment to motorsport. Bernard Ollivier, Deputy Managing Director, Alpine, comments: “Alpine is one of those rare automotive brands that comes from motorsport. Jean Rédélé created Alpine because of the success he had in motorsport. When we relaunched Alpine, we decided very early on that we would engage the brand once again in racing. “It was a very important decision because motorsport is in Alpine’s DNA. The marque has achieved so much in racing over the years and I’m very pleased we have been able to continue that story by winning the European Le Mans Series and the LMP2 FIA World Endurance Championship. The network will feature seven Alpine Centres across the UK and will leverage Renault Retail Group and partners sites across the UK. The Alpine Centres have been chosen for their locality to prime regions for sports car enthusiasts. The Alpine Centres will all have bespoke Alpine Advisors in order to ensure levels of knowledge, expertise and passion that match the brand and, most importantly, customer expectations. The welcoming showrooms have been thought through to mirror the brand thanks to an interior design that makes use of simple, authentic materials incorporating touches of Alpine blue. Individual visitors will be welcomed by an Alpine Advisor whose role will be to guide customers along their buying journey and share their passion for Alpine by introducing, or reintroducing, them to the landmark moments of the brand’s illustrious history as well as explaining the new car’s use of lightweight materials and construction methods. Created to be a true showcase for the historic brand with Alpines new and old on display, Studio Alpine London will open in Q2 of 2018 with further details to follow nearer its opening. It will be operated and managed by Renault Retail Group London West. London Studio Alpine London: definitive address to be confirmed at a later stage. Designed and manufactured in France, the mid-engined, two-seater coupé features aluminium construction to keep weight to a minimum of 1,103 kg. The A110 Première Edition is powered by a turbocharged 1.8-litre four-cylinder petrol engine, which develops 252PS. The car’s excellent power to weight ratio (228PS/tonne), plus a launch control function, enables the A110 to sprint to 100kph in 4.5 seconds. Its top speed is electronically limited at 250kph. The lightweight construction ensures excellent fuel efficiency (6.1L/100km combined) and low CO2 emissions (138g/km), too. Limited to 1,955 examples – a nod to the year Alpine was founded – the A110 Première Edition was fully reserved within five days of going on sale. The first new model for two decades, the A110 Première Edition marks the relaunch of Alpine. Conceived as a standalone business unit within Groupe Renault, Alpine has an ambitious long-term strategy that invokes the vision and determination of its founder, Jean Rédélé. Customers can discover more about the new A110 and the Alpine brand and its heritage at alpinecars.com. They can also research and even reserve their car via the Alpine mobile app (available to download via the App Store or Android Store). The app allows the customer to choose their preferred Alpine Centre, interact with an online Alpine Advisor and act as a one stop shop for keeping up to date with Alpine.